It’s time to turn your holiday into an unforgettable experience, not only must one choose the right destination, the leisure activities available but even those day trips we want to enjoy on our days off. Getting the most out of a destination, living it and returning happy, satisfied and with our batteries charged thanks to the right hotel. Mallorca is one of those parts of our country where choosing the right accommodation is crucial. Although the beauty of the island is unquestionable and the tranquility outweighs the hustle and bustle, the truth is there are so many hotels in Mallorca that it is necessary to make a choice depending on how you like to travel (either as a couple, with friends or family) your budget and your goal (culture, leisure, party, gastronomy, etc.). The trick? Choose the only hotel chain that offers you it all and more, a chain like Garden Hotels. With a selection of seven hotels spread across the island (especially in the north of the island); Garden hotels are perfect for those looking to enjoy a romantic trip as a couple, a few days with friends on the beaches of Mallorca or, as a non-traditional place for family tourism (great for the summer months). Thanks to this range of choices, guests can combine their relaxation time with a wide and exciting range of sports (with Garden Sport) as well as SPA treatments thanks to Garden SPA; and, unique excursions to spectacular locations on the island of Mallorca thanks to ECO Garden. Would you like to experience a great hotel chain in some of the most beautiful spots on Mallorca? Well you’re in luck because if something has made Garden Hotels one of the country’s best hotel chains it is its wonderful offers on its hotels in Mallorca. From its establishment in Cala Millor, to its apartments in Alcudia … All offer more than 10 percent discount. 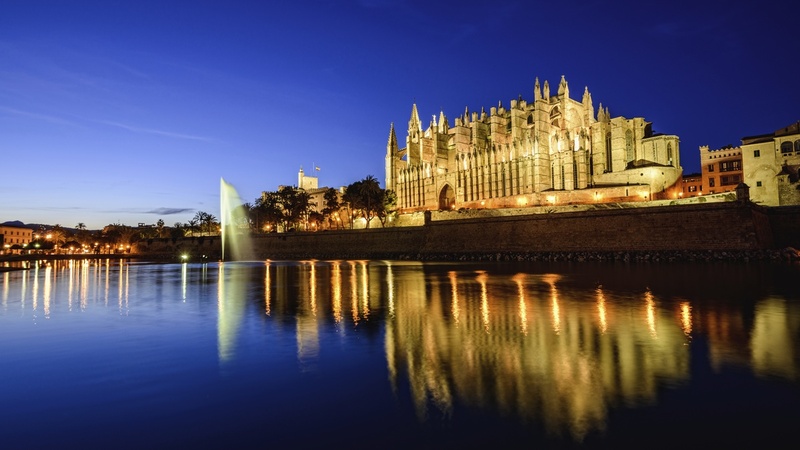 This entry was posted in Majorca and tagged Alcudia, beautiful spots Mallorca, Calla millor, Garden Hotels, hotels in Alcudia, Hotels in Mallorca, Mallorca, romantic trip on 12 September, 2016 by Luke Durden. Sometimes you spend so much time trying to organize your holidays, that finally you don’t enjoy them. For this reason we suggest you a friends getaway to a sun, beach and entertaining destination. This 3 magic words belong to a popular destination in Majorca: Magaluf, in the West Coast of Majorca with spectacular beaches and a great nightlife area where the party never ends. Magaluf is easily accessible thanks to its great connections with Palma’s airport (only 25 minutes drive) and its orography, full of beaches, pine groves and mountains, golf courses… Not to mention it’s excellent services. In reference to gastronomy, there are many restaurants oriented to British tourists-main tourists in the area, and you should taste the gastronomic specialities which are already part of Majorca’s culture. In reference to accommodation, you will find everything you need: from family hotels at Magaluf Beach to hotels for friends between Magaluf and Palmanova. One of the best hotels due to its renovation and new modern design is The Fergus Resort, by Fergus Hotels. This 4-star family hotel in Magaluf offers an innovative accommodation with high quality facilities. It’s a design hotel in Majorca oriented to travellers looking for entertaining and cool places close to the beach and all the services. Near this new style hotel by Fergus Hotels, in this area of Magaluf some of the best themed hotels in Majorca are being completely renewed as Sol Hotels by Melia. Despite Magaluf attracts mass-tourism, it’s the perfect destination for those travellers looking for customised, package and affordable holidays. For this reason, it’s a popular destination for friends’ getaways in Majorca, bachelor parties, romantic weekend escapes or family holidays with kids. Magaluf belongs to Calvia municipality and it’s one of the most popular destinations in Majorca, as many celebrities have their second houses there. Magaluf is close to Santa Ponsa and Palmanova, both oriented to family holidays with children and senior travellers on low season. Magaluf offers panoramic views of Palma Bay with more than 1,7 kilometres of beach in front of the hotel zone, so whichever hotel you choose, you will enjoy it for sure. This entry was posted in Majorca and tagged acommodation magaluf, destination magaluf, family friendly hotel magaluf, Fergus hotels, Iberostar Playa Gaviotas Park, summer 2016 on 28 April, 2016 by Luke Durden. Is there is a holiday paradise where you will find almost anything you’re looking for, that would be Majorca undoubtedly. Being one of the homes of tourism in Spain, where the hotel industry is one of the most innovative, adventurous and varied of all the Mediterranean coast and a good part of Europe as well. Because of this, we can easily find the most unique hotels in Spain and some of the funniest accommodations in the family category. On this occasion, the Your Hotel Destination team has prepared a small selection with the Majorcan most recommended hotels, for those who like to try a different type of holiday in Palma, take a trip to one of its beautiful coves or having fun with their children in a theme park. Some of them have been reviewed before, the reasons are no other than since the hotel open until nowadays these unique hotels are revolutionary concepts and they really worth a try, come and live the most authentic summer this 2015! Are you ready to start your adventure? The Sol Katmandú Park & Resort accommodation is the right place to begin, an authentic theme park in Magaluf that will lead you to a magical and funny holiday that you have never seen before. The best place for a holiday with family or with friends, since it’s next to the Magaluf beach, where you will find bars, malls, restaurants and all the activities you need to complete your holiday: sailing, surf, diving, bicycle routes, enjoy the local gastronomy, minigolf field, beautiful crystalline coves, etc. This accommodation is an innovative idea from the Melià Hotels International during the past years, and it’s part of a family resort chain called Sol Hotels. With a good value for money, a whole new experience, without a doubt. This hotel is like a Christmas gift: it has it all, more and better. In fact, is one of the most famous deluxe hotel in Majorca despite not being a traditional beach resort, we talk about the IBEROSTAR Son Antem. An original resort, located in the Majorcan countryside, surrounded with 2 of the best golf fields of the island (both with 18 holes) and with spectacular gardens, and roads between the typical Mediterranean vegetation. The moment you enter you feel like if you go to another dimension, disconnect yourself from all the city noise and the crowed beaches full of tourists. An oasis in the middle of Majorca. Just 15 minutes away from the centre of Palma by car and just a few steps from the the best coves of Llucmajor, a town that belongs to the zone of Son Antem. Recommended for a relaxation break (it has one of the best spa centres of the island), business and social events, golf tourism and family holiday services, to cover all the children needs as well as comfortable accommodations for the whole family. The price is very competitive, turning it into one of the most affordable deluxe hotels in Majorca, thanks to its peaceful atmosphere, many locals come to enjoy the brunch, the spa, the pools and a lot of different activities. We’re still in Magaluf, browsing through the Sol hotels portfolio. On this occasion, we will dive right into the pool of the Sol Wave: A hotel across the sea in Magaluf where you can practice surf with a view to the sea without even having to leave the facilities. Its artificial wave pool is a singularity in the whole country, it gathers many travellers who love surf but want to enjoy the best amenities in a festive and relax environment in Majorca. In addition to that, the hotel is part of a large complex with other services such as the Majorcan Café del Mar, a sunset spot just like the one in Ibiza, where you can enjoy the moment with a drink. Ideal for those who travel with friends, stag and hen parties, and couples who look for a cool place to spend their holiday in Majorca. Speaking of couples looking for a summer oasis…the Sol Beach House Cala Blanca, next to the Sol Wave, is your destination. A design hotel in Magaluf, created to host adults only here in Majorca, next to the ocean, colourful, a unique environment, relaxing music, modern chill out zones and everything else you will need to enjoy the most cool holiday in one of the most animated spots of the Mediterranean summer. It might not be cheap, but it worth its price if you’re looking for a new experience, with all the Majorcan glamour and a varied list of adult services. Plus, the Sol Hotels official website offers you interesting packages if you book beforehand. Last note: They just renewed the room’s decoration and changed the whole food menu to a healthier, ecologic and hipster style. A modern hotel for modern people. Book in a hotel in the Passeig de Majorca is very distinguished, but doing it at a very affordable price is to brag big time. And this is possible in the next accommodation, we’re talking about the Palladium Palma Hotel, a lovely boutique hotel next to the Jaime III (town’s most commercial street) with rooms with a view to the Passeig de Majorca, special features for business travels, events and meetings, but also with comfortable spaces to relax and enjoy the free time: patio, sauna, gym and personal service 24 hours. This entry was posted in Majorca and tagged deluxe hotel in Majorca, Iberostar Son Antem, Palladium Palma Hotel, Sol Hotels, sol katmandu park & resort on 14 May, 2015 by Loren Reshen.